I picked up some comics and a science fiction book yesterday! The comics were the latest House of Mystery (which technically came out weeks ago, my timesense - not so great) and Daytripper - I can't comment on the latter yet, but HoM is wonderful as always. I am developing quite a <3on for Matthew Sturges and his impeccable comic timing. 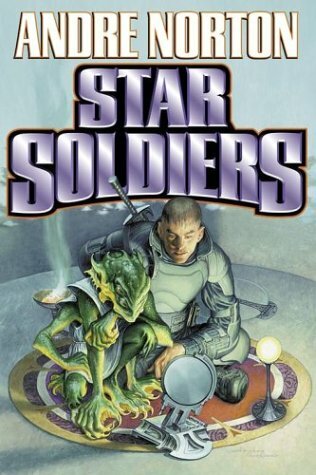 Anyway, the book was Star Soldiers, by Andre Norton. I got the book because it consists of what used to be two books, Star Guard and Star Rangers. I have a big hardcover of Rangers on my shelf. It's so old the paper jacket has fallen apart, although I still have the cover somewhere because it has cool lizardpeople on it. I reread that book dozens of times throughout my adolescence - it's exciting, fast-paced, just angsty enough and just epic enough without taking either of those to the hilarious extremes common to - well, mostly common to fantasy, but I've seen science fiction do it, *cough* McCaffery *cough* anyway. I was a big damn fan. And I knew that book had ~sequels, but I could only ever find Norton's work in second hand bookshops, and then it was usually her fantasy series, which didn't look remotely as awesome as Star Rangers and wasn't the type of fantasy I like anyway. So when I saw that Galaxy bookstore in the CBD had a bunch of Norton books I basically couldn't resist. Unfortunately there wasn't a copy of the prequel that did not come attached to the book I already have, and I suspect the lone book is out of print, so I just bought the whole thing. Norton is an interesting case - her storytelling skills are excellent, she's quite prolific, she was a successful female science fiction writer at a time when SF was very much a boys' club - albeit with a vaguely androgynous pen-name. But she was a science fiction writer at a time when SF was very much a boys' club. I am up to page fifty one of Star Guard, and there has not been a single woman in it yet. It's sort of fascinating, that kind of wilful blindness - no women in the army, no mention of why there are no women in the army or even of the possibility of another culture having a different system even though humanity has been exposed to actual aliens for three hundred years. In fact, even when talking about the ~different culture~ of some of those aliens, a character mentioned that their leadership was passed down through the female line - not that they had female leaders, you understand, but that the old leader's eldest sister's son would succeed him. Just complete gender-blindness. Ohhh the nineteen fifties, what a weird little anthropological culdesac you were. Mind you, however far we've come since the fifties... this was re-released postmillennium, and yet nobody thought to either make the cover artist actually read the book or at least inform him that the main character is not white. We're in fact explicitly told fairly early on (before we meet any women, for one thing, not that I'm bitter) that his blue eyes were startling in his dark face, and as if that wasn't enough he later muses on his "Australian-Malay-Hawaiian" heritage. An off-hand reference is made to European refugees fleeing into North Africa after a nuclear incident of some kind. It is pretty hard to miss that this is not the Brady Bunch. Just thought I'd mention that in light of the internet's recent spate of pointing out cover-washing in modern YA, yeah? Giant cultural blind-spots: not just for the classics. Also interesting that she's written a world apparently without racism (I guess that's been replaced by species-ism, humanity kind of gets the short end of the stick in this universe) but has managed to completely forget about women. Do you think it's overcompensation from someone trying really hard not to be dismissed on account of her gender in the SF climate of the time? Trying too hard to be one of the boys? STOP HOWLING, YOU CAN HAS ANIMAL METAPHORS, WE GET IT ALREADY. Anyway, I started to comment on bexless's entry about moar spoilery aspects of the movie and got all tl;dr - lucky you, y'all get to read it instead, with bonus tl! It goes from the squee-worthy to the interesting meta to the lulz and then one or two problematic bits.